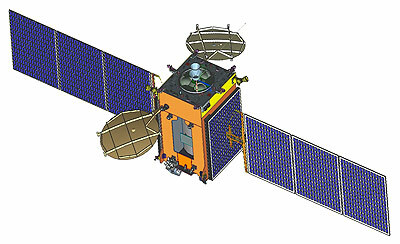 GSAT-19 is an experimental Indian geostationary communications satellite. GSAT-19 is to act as test bed for several new technologies on a standard I-3K bus. The 3136 kg satellite carries a Ka- and Ku-band high throughput payload along with a Geostationary Radiation Spectrometer (GRASP) payload to monitor and study the nature of the charged particles and influence of space radiation on spacecraft and electronic components. GSAT-19 also features certain advanced spacecraft technologies including miniaturised heat pipe, fibre optic gyro, Micro Electro-Mechanical Systems (MEMS) accelerometer, Ku-band TTC transponder, as well an indigenous Lithium-ion Battery. The satellite was launched in early 2017 on the maiden orbital flight of the GSLV Mk.3 launch vehicle.